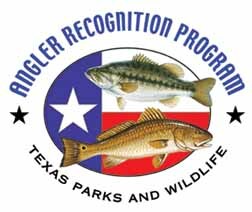 Texas Parks and Wildlife Department recognizes fishing excellence through its Angler Recognition Program. The program maintains state record lists for public and private waters and water body records for all public lakes, rivers, and bays. Junior Anglers (under 17 years of age) compete in a separate division. The program also issues certificates for other types of angler achievements. Use the links on this page to search current records, review the types of awards available and learn how to submit your catch.